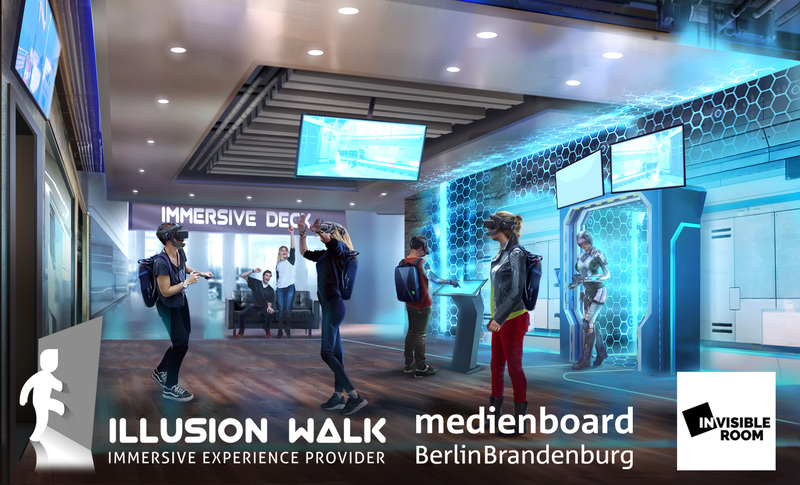 Berlin, July 6, 2017 – The “Medienboard Berlin-Brandenburg” (media board Berlin-Brandenburg) funds the development of a new virtual reality experience for the Immersive Deck by Illusion Walk with 60,000 Euros. In the second round of funding for 2017, the media board chose the project “Sleeping Giant” along with other projects in the field of innovative audio-visual content. Sleeping Giant sends a group of six players on a walkable, multi-sensory VR adventure of light and shadows. Over three levels, the players must defeat the black and white in a man’s head. The VR experience is accompanied by an actor live. The Berlin VR studio Invisible Room will realize the content development. lllusion Walk is a Berlin-based startup working on the development of a walkable virtual reality platform named “Immersive Deck”. We combine the latest hardware technology with our own software to bring our users the ultimate immersive experience: To walk through large-scale virtual spaces together, experiencing fantastic adventures. The Immersive Deck is a real-time holodeck based on a unique, interactive multi user concept aiming at applications including gaming, edutainment, virtual training, and VR showrooms. The “Triple-Track®” software fuses existing tracking and motion capture technologies with high-end real-time rendering. The modular structure allows for selection of the ideal setup for many different applications, from multiplayer gaming or walkable VR showrooms to virtual training scenarios. The Medienboard Berlin-Brandenburg is the body responsible for Film Funding and Media Business Development in the states of Berlin and Brandenburg. It is also the first point of contact for international and German professionals active in the film and media industries. We concept and produce interactive multisensory experiences by connecting the real and the virtual world with an emotional dialogue. Not just by using cutting edge technology, but by creating integral immersive experiences that will take storytelling to the next level.